Human eye in Earth's night sky. Astronomers find more nearby stars every year. Including Sol itself, at least 150 celestial objects (including white and brown dwarfs) are currently believed to be located within 20 light-years (ly) of Sol. Except for a few objects (such as Lalande 21185, Kapteyn's Star, and methane brown dwarf WISE J0254+0223) astronomers believe that Sol and most of its nearest neighbors were born in the Milky Way's "thin disk." A few (such as Barnard's Star and Kapteyn's Star) may be as much as 10 or more billion years old. By comparison, Sol is middle-aged at almost 4.6 billion years old, while younger stars include the Sirius binary system with perhaps around 300 million years. red stars (M=0.08); white dwarfs (D=0.5); and brown dwarfs (0.05). At least two-thirds (88+ or 66+ percent) of the 150 or so objects found thus far to be located within 20 light-years are very dim red dwarfs, of which at least 39 (roughly half) may be flare stars and are likely to be relatively younger. 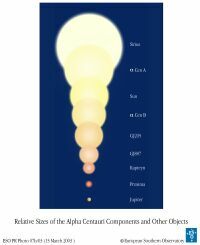 As many as six stars within 20 ly may currently be brighter, larger, and more massive than Sol, but at least two (Sirus B and Procyon B) of the eight known nearby white dwarfs that are now much dimmer and smaller than Sol were once also brighter, larger, and more massive. In addition, 10 to 25 substellar brown dwarfs that are much more massive than the planet Jupiter have been detected, with and without stellar companions (see Gliese 229 b versus LP 944-20). much larger than Jupiter (more). The volume of space lying within 20 light-years of Sol encompasses over 33,509 cubic light-years. Within that vast sphere, astronomers have been able to detect at least 50 Solar-masses of visible matter bound up in 138 luminous stars and weakly glowing white and brown dwarfs thus far. Hence, the local density of luminous mass is low, less than 2/1,000 (or 0.0015) of a Solar-mass per cubic light-year -- not even the mass of two Jupiter-sized planets. Within 20 ly of Sol, astronomers may have detected planets in the Solar System and around 12 other stars (Alpha Centauri B, 82 Eridani, Epsilon Eridani, Gliese 876 / Ross 780, CD-44 11909 / Gl 682, CD-46 11540 / Gl 674, CD-49 13515 / Gl 832, Gl 229, Groombridge 34 A, Kapteyn's Star229, Lalande 21185, Tau Ceti, and Wolf 1055 B (VB10, or Van Biesbroeck's Star), as of September 2014. Other than Sol itself, however, only around perhaps 17 stars out of 14 star systems (including such G stars as Alpha Centauri A) may possibly be capable of hosting Earth-type planets in stable orbits within their respective circumstellar habitable zones (CHZs). Within a CHZ orbit, liquid water may be possible on a planetary surface without tidal locking and orbital disruption from another celestial object. The following celestial objects are located within 20 light-years (ly), or 6.1 parsecs, of Sol. 0.0 Sol G2 V 1.000 ... 8+ planets, dust, brown dwarf b? 16.6 70 Ophiuchi A K0-1 Ve 0.92 Ophiuchus a=23.3 AUs, e=0.495, spec. dou.? 16.6 70 Ophiuchi B K5-6 Ve 0.92 Ophiuchus Spectroscopic double? 8.6 Sirius B DA2-5 1.00-1.03 Canis Major High mass, carbon core? 4.2 Proxima Centauri M5.5 Ve 0.12 Centaurus Flare star; brown dwarf b? 8.3 Lalande 21185 M2.1 Vne 0.46 Ursa Major Flare & thick disk star; 3 planets? 11.1 EZ Aquarii A M5.0-5.5 Ve 0.1~ Aquarius EZ Aquarii, flare star? 11.1 EZ Aquarii B M5? Ve 0.1~ Aquarius EZ Aquarii, flare star? 11.1 EZ Aquarii C M? Ve 0.1~ Aquarius EZ Aquarii, flare star? 13.2 +/- 0.1 DENIS 1048-39 M8.5 V 0.06-0.09 Antlia Brown dwarf? 13.4 Ross 614 B M8 V 0.097 Monoceros Flare star? 13.8 Wolf 1061 A M3.0 V 0.26 Ophiuchus V2306 Ophiuchi, close binary? 14.8 BD+68 946 B? M? ? Draco Spectroscopic double? 15.9 AD Leonis M3.0-3.5 Ve 0.39 Leo Flare star, brown dwarf b? 13.2 +/- 0.1 DENIS 1048-39 M8.5 V 0.06-0.09 Antlia M (red dwarf) star? 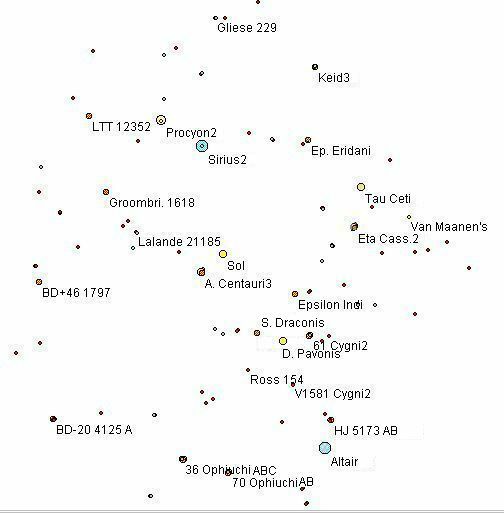 Summary information on stars within 10 light-years alone and stars and related celestial objects within 10 parsecs (32.6 light-years) are also available. 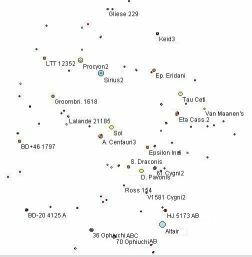 Up-to-date technical summaries on these stars can be found at: the Research Consortium on Nearby Stars (RECONS) list of the 100 Nearest Star Systems, the NASA Star and Exoplanet Database, the Astronomiches Rechen-Institut at Heidelberg's ARCNS, and the SIMBAD Astronomical Database. New research papers on these stars may eventually become available at the SAO/NASA ADS. Additional information may be available at Roger Wilcox's Internet Stellar Database. © 2005-2014 Sol Company. All Rights Reserved.